SEO for ecommerce is do-or-die. If you don’t get traffic to your site, you won’t win customers. No customers, no business. And since building an ecommerce store can be an intimidating task all by itself, adding that extra layer just isn’t fun. But thankfully, platforms like BigCommerce exist to try to make both of those burdens a little easier on you. In this article, I want to examine the capabilities of BigCommerce and share some tips that will help you get traffic if you decide to use it for your store. First off, let’s look at why you should consider this platform in the first place. 2 Is BigCommerce a Good Ecommerce Platform for SEO? There are quite a few items in the plus column for BigCommerce, so I’ll try to cover them briefly before moving on to specific e-commerce SEO capabilities. BigCommerce is an online store builder that allows you to customize and design a presence that can sell products through your site, Amazon, eBay, and even Facebook. So if you’re looking for a multi-channel selling platform, BigCommerce should be on your list. According to self-reported statistics on their website, the brands that use BigCommerce report an average of 28% annual growth. That’s about twice the industry average, so you know that they’re doing something right. As for more generalized benefits, you’ll be able to choose from a wide variety of themes when you build your store. You’ll also have access to a broad spectrum of payment options like Stripe, Square, or Paypal, as well as some rather robust marketing tools. And of course, BigCommerce offers some fairly intuitive product management capabilities, as well as solid online support if you encounter issues. As for pricing, it’s hard to imagine a more affordable system that delivers on the promises BigCommerce offers. Out of the box, a new business will only be on the hook for $30/month. 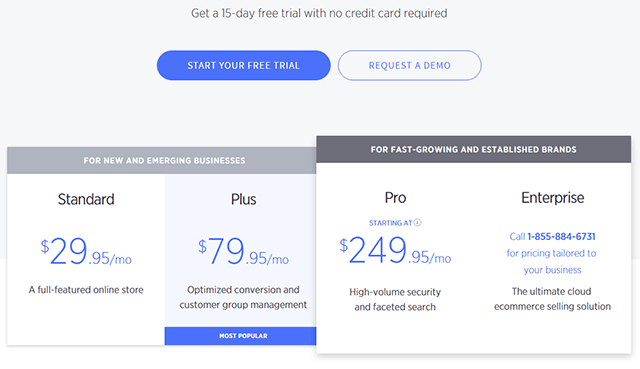 Of course, if you want better conversion optimization (and SEO), you’ll need to shell out $80/month. For some smaller businesses, that may still seem like a steep price tag. 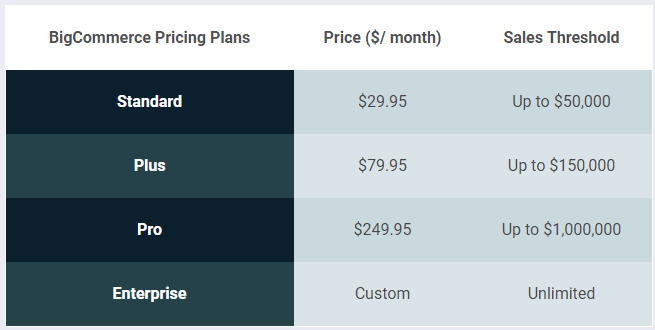 And on top of that, BigCommerce does enforce certain sales thresholds for each of their pricing plans. While you probably won’t have to worry too much about your price if you’re hitting these thresholds, it’s always good to know that they may upgrade your plan for you. But all things considered, BigCommerce isn’t a bad choice when considering an ecommerce platform for your business. You can create a simple, clean, and intuitive store from a centralized system that lets you focus on running your business. So from a broad view, BigCommerce looks like a great option. But now let’s look at it solely from an SEO standpoint. 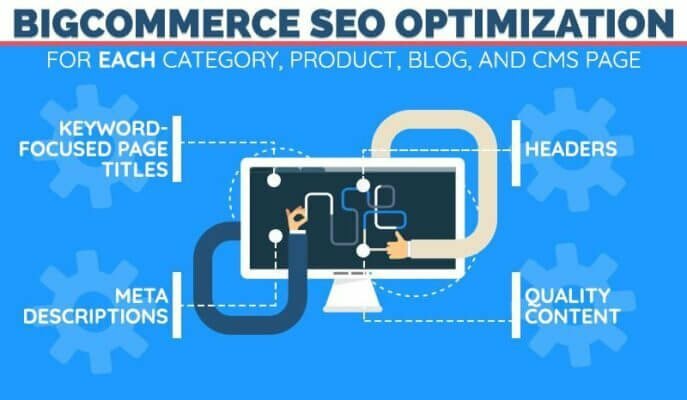 Is BigCommerce a Good Ecommerce Platform for SEO? Out of the box, BigCommerce’s SEO capabilities aren’t bad. Much like Magento, they built this platform with best practices in mind, so you can be reliably sure you aren’t setting yourself back by choosing this option. But SEO will always require more tools and customization, and BigCommerce is aware of that. To help your SEO efforts, they offer a range of tools to help you optimize your site. They also provide you with a mobile-optimized site that works with Accelerated Mobile Pages (AMP), which means your site will be well suited to your mobile audience. With Google’s recent mobile-first indexing, that’s a huge plus to your SEO. And of course, like other ecommerce platforms, you have a well-stocked app store that can help you expand both your store’s reach and your SEO capabilities. So all things considered, the SEO for BigCommerce is very capable. You’ll need to find ways to help it along if you want to beat your competition, but you’ll have plenty of tools at your disposal for that task. But that being said, there are still certain SEO blind spots that you’ll need to cover to fully optimize a BigCommerce store. For the rest of this article, we’ll look at some tips that will let you do just that. For BigCommerce, and for anyone trying to rank on a search engine results page, SEO starts with good keyword research. Keywords are the basic building block for your SEO. If you’re able to optimize a page for words that potential customers search for, then you raise the chances that they’ll find your site. One of the best starting places is the free Adwords Keyword Planner from Google. By inserting keywords that are relevant to your product or brand, you can find high-volume keyword suggestions that are more likely to bring in traffic. Use this tool to find as many keywords as you can to help optimize your site. Of course, it’s always a good idea to use more than one tool to fully flesh out your keyword research. Some tools offer different data points and suggestions, so it pays to check out multiple different keyword tools. This will inform and direct your SEO for content, product pages, and everything else on your site. Just keep in mind that some keywords will be harder to rank for, so create good content and fine-tune your approach over time. 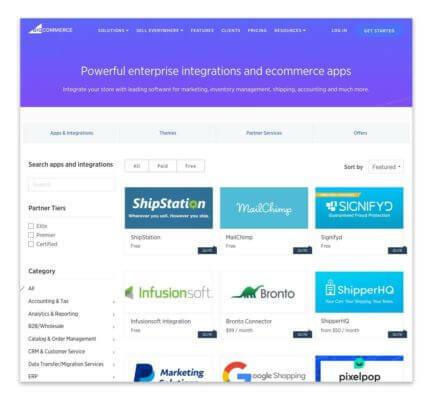 Some of the biggest points in BigCommerce’s favor are the native tools on their platform that help you fine-tune your on-page SEO. Many platforms force you to maneuver around baked-in settings that you can’t change, but that isn’t the case with BigCommerce. 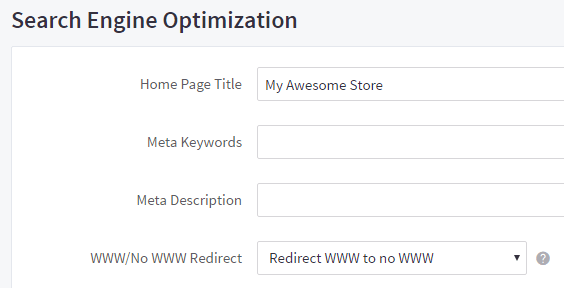 And thankfully, BigCommerce makes this simple with dedicated SEO fields that allow you to fill in your metadata for each page. Instead of having to edit HTML, all you have to do is add a meta description, keywords, and title (all on-page SEO elements). Aside from creating quality content, this is a one-stop solution that will help you cover the basics of your on-page SEO. You’ll need to do this for each page on your site, but the effort will be worth the payoff in traffic and revenue. As I mentioned in the assessment of BigCommerce’s SEO capabilities, Google has transitioned to a mobile-first indexing. What that means is that your mobile site is going to have a bigger impact on your SEO than the desktop version. 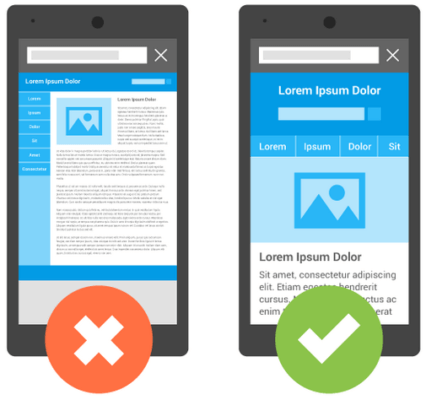 So you can see how essential it is to optimize the design of your site for mobile use. The best way to do this for BigCommerce is to use a theme that automatically makes your site responsive to mobile devices. That means instead of zoomed-out, hard to use pages, you have a scrollable and tappable page. One option for this is to use BigCommerce’s default mobile theme, which will automatically make a responsive version of your site. However, if your desktop theme isn’t responsive, there could be issues when BigCommerce makes the transition for you. A better option would be to use a theme that supports mobile responsiveness from the start. The Stencil Theme Platform comes highly recommended for this, and even has some features that will help with other SEO elements for your store. You can also check out the theme store to find other options that may suit your overall branding better. That means that from now on, how fast your site loads is a vital aspect of your technical SEO. If you want to win organic traffic, you need a fast site. To test your speed, you can use one of the various tools available on the Internet. 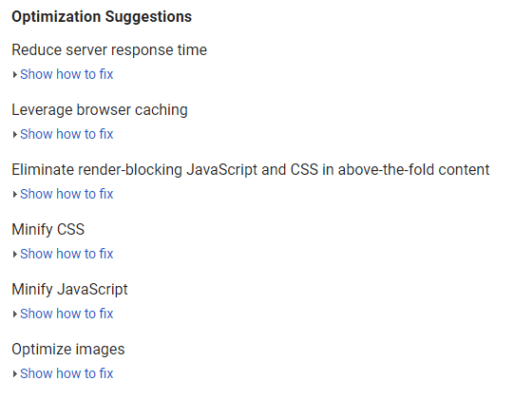 One solid choice would be PageSpeed Insights from Google. This free tool allows you to input a specific page on your website, test its speed, and get valuable tips for improvement. Following this advice will allow you to speed up your site and improve your site’s overall SEO. 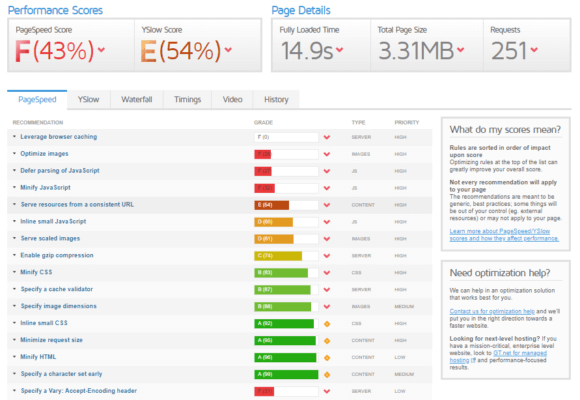 Another potential tool you can use is GTMetrix, which works very similarly to PageSpeed Insights. This tool aggregates your PageSpeed score and your YSlow score provides exact performance details, and then offers direction on how you can start improving your speed. Once you discover how your site performs, your next goal is to find ways to improve the speed. No matter what you’re selling or where you rank, this is always a good idea to improve performance even more. By lowering load times and improving the overall speed of your site, you’ll be able to see a drastic improvement in your SEO and the organic traffic to your site. Without this step, your product pages may stay at the bottom of the search engine results page. As previously mentioned, to fill out your SEO you’ll likely want to integrate an app to your store. With any ecommerce platform, this is just a good move, as it gives you a system to fall back on to double check your SEO efforts. One such app is FavSEO, a well-reviewed and robust SEO platform that audits and scores your overall SEO efforts. It also takes care of essential elements like your sitemap and keyword performance, so you can focus on trying to sell your products. Whatever app you choose from the Bigcommerce app store, make sure that it helps you optimize essential elements like product descriptions and page titles. With the right pieces in place, your traffic will start to increase over time. When you’re building your site, site navigation is one of the key elements you need to consider for a solid SEO strategy. You want your site to be easy to use no matter where someone enters. That includes your product and category pages. This method has been proven to allow low-authority sites to rank higher than competitors with tons of backlinks. 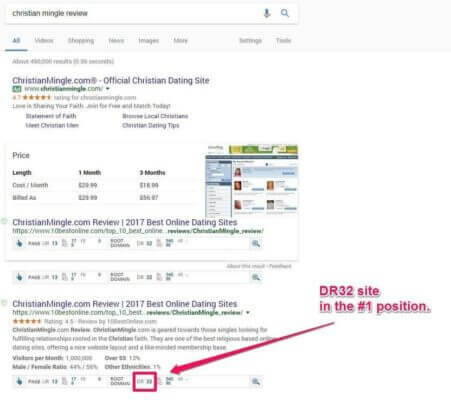 In one case, a site with a domain rating score of 32 was able to beat one of its largest competitors using siloed pages. This method starts with solid, optimized category pages. Then, in each silo content should be internally linked up to the category page. This signals to Google that these pages are some of the most important pieces of your site, which boosts their overall SEO. But that isn’t all you should do. You need to ensure that these category pages and the product pages beneath them are completely optimized. That includes headings, solid content, a good user experience, and keyword targeting. When all of these elements come together, it’s a powerful SEO strategy. When you click one of this category page from the homepage, related products are laid out, and when you click on one it will take you to a product page. And here’s an example of one of their product pages, which includes a healthy amount of copy, solid imagery, and a variety of options that customers can select. Each of these pages display adherence to the on-page SEO guidelines we saw above, and then go the extra mile by optimizing images, copy, and other technical elements behind the scenes. 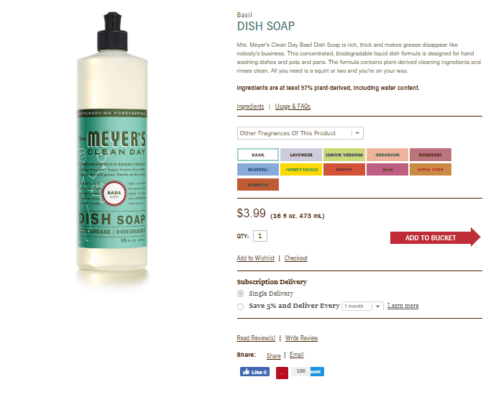 And since they’re in a single silo, each of these product pages help boost the SEO of the overarching category page. Once again, every category and product page on your site should get the same level of optimization. It increases the overall SEO of your brand, and improves the possibility that you’ll rank for your targeted keyword. 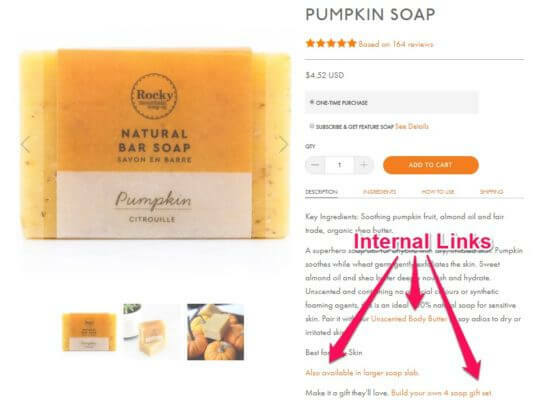 I briefly mentioned in the last tip that internal linking helps your SEO when you silo your category and product pages. Let’s dig deeper into how you can approach this strategically in each silo. Years ago, when Google PageRank scores were still visible to brands, SEO experts discovered that you could shuttle value between pages using internal links. This concept became referred to as link value. While we can’t see those PageRank scores anymore, it’s still clear that internal linking can be used strategically to boost the SEO of high-value pages on your site. And when paired with a silo architecture, your internal links can become much more powerful. The ultimate application of this is to link to best-selling or other relevant products in the copy of your product pages, blog posts, and landing pages. As you can see, the page provides internal links that attempt to upsell or cross-sell products. It also acts as a signal to Google that other pages may be more important to the brand than this particular product. The takeaway is to use internal links carefully and deliberately to enhance your SEO for important products and pages. Your SEO will have more direction, which is much better in the long-term. Ecommerce may be do-or-die, but platforms like BigCommerce make it easier to stay ahead of the competition. With plenty of customization, benefits, and growth potential, BigCommerce is a good choice for any business looking to sell online. And with solid SEO potential, it’s easy to see why many businesses are using them. But as with any platform, you still need to put in some effort to get to the top. Start by performing some basic keyword research to help inform and direct your overall SEO strategy. Then, use those keywords and BigCommerce’s dedicated SEO fields to optimize every page on your site. It’s also in your best interest to design your site for mobile-first indexing, as that will be the biggest signal Google looks for moving forward. You should also take steps to optimize your site’s speed, as that will directly impact how users interact with your site. Also, be sure to supplement your SEO with a solid app from the BigCommerce app store. This will help ensure that nothing falls through the cracks, and will start generating traffic over time. 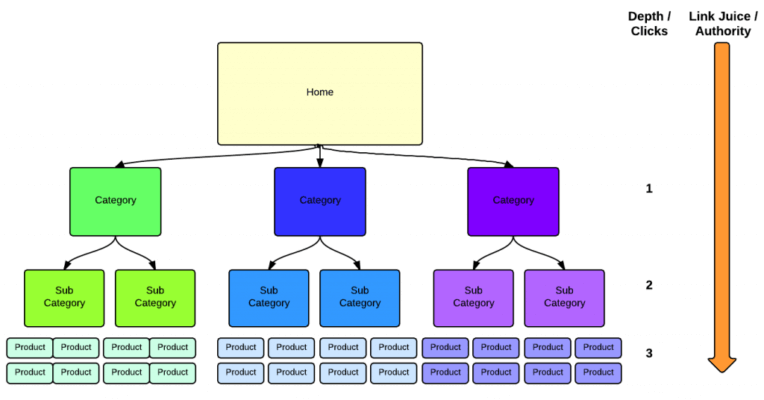 Take the time to work on the SEO of your category and product pages. They need the same effort that your homepage gets. Finally, build a strategy for your internal linking and stick to it. You’ll be able to direct your SEO and see results over time. And with that extra traffic, you’ll be much closer to the growth and success that all ecommerce businesses hope for.